Any questions or queries on this please don't hesitate to get in touch. Heads Up! Your September Style Essentials Have Landed. Free Shipping across UK and Europe on all orders. New Era are now offering Free Shipping on ALL orders across Europe*. If you order below £25/€45 then your parcel will be delivered FREE through our economy service. If your order is above this, then we'll send your delivery through our faster, tracked service at no charge! Either way, customers can now benefit from free delivery on all orders across Europe. Of course, if you're eager for your parcel or have a last minute gift to purchase, you can opt for our next day delivery service for a small additional cost. What's more, is that if your order is above £75 we'll throw in that Next Day Delivery free of charge too! With great shipping options, there's never been a more attractive time to promote New Era and get your sales in. *excludes Germany. See terms and conditions. Our top publishers are currently seeing a conversion rate of 18% and with all the great offers we're introducing, there's no better time to get involved. If you have any further questions or would like to talk to us, contact our Acquisition and Affiliates Manager, Annayah Feroz on email at: annayah.feroz@neweracap.com. We're always happy to hear from you and work on bespoke deals that meet your goals. Offer valid until 31st August 2015. Creative and banners available on AWIN interface. Extra 30% off until this Sunday ONLY. The launch date for our new-look website is getting closer and closer (September 2015 - watch this space). To sell all our end of season stock, we're giving away an EXTRA 30% off our Outlet items which ends THIS sunday. Starting from Monday and running until mid August, we're bringing back our popular £5 off £35 spend offer. Code applicable on all purchases except New Era by You customised items). NFL Vintage Collection. Authentic. Original. Unforgettable. Mastering the art of the Original NFL, our Vintage collection combines crackled pigment prints with hand stitched badges and original silhouettes for the ultimate style hook up. Creative and banners available on the AWin interface. Make a statement with the Street Art collection. Creative available on the AWin interface. Make a statement with the New Era Flag collection. Creative available on the AWin interface. Of course, if you're eager for your parcel or have a last minute gift to purchase, you can opt for our next day delivery service for a small additional cost. What's more, is that if your order is above £75 we'll throw in that Next Day Free Delivery change too. The launch date for our new-look website is getting closer and closer (September 2015 - watch this space). To sell all our end of season stock, we're giving away an EXTRA 30% off our Outlet items. TREAT30 An additional 30% off Outlet items. 23rd July 2015 Limited Time Only. If you're new on our programme or you've been a bit quieter than usual, we're offering a £5 bonus payment on your first order to get you started. This is ON TOP of any normal commission earned and will be payable within 21 days of the qualifying order being received. We have now extended the promotion to run until the end of July which gives you plenty of time to start your campaigns. To qualify for the bonus payment, it must be your first order since January 2015. Any questions? Feel free to send them here. Sport is nothing without passion. Art is passion, or it is nothing. A collection inspired by an art form that shaped a generation. Creative available on the AWin interface. Our top publishers are currently seeing a conversion rate of 18% and with all the great offers we're introducing, there's no better time to get involved. If you have any further questions or would like to talk to us, contact our Assistant Web Manager, Annayah Feroz on email at: annayah.feroz@neweracap.com. We're always happy to hear from you and work on bespoke deals that meet your goals. Buy One Get One HALF PRICE on Kids Range. With the glorious weather we've had recenty, we know the biggest concern for parents is to protect their children from the harmful effects of the sun. Built into our Diamond Era range, we have SOLARERA offering 50+ UV protection and COOLERA terchnology with temperature control to keep your little ones cool. Our products in the kids range are priced from as little as £10 (full priced items) or you can grab a bargain in the sale that's on right now. With the buy one get one half price offer, there's tonnes of savings to be made. Our Summer Sale is now in full swing and with further reductions of up to 70% off original price later this week, we're expecting a record number of sales.. We have lots of banners and creatives for you to use - these have been uploaded to the AWin interface under the Events and Promotions tab. Of course, if you're eager for your parcel or have a last minute gift to purchase, you can opt for our next day delivery service for a small additional cost. What's more, is that if your order is above £75 we'll throw in that Express Delivery free of charge too. New Era x Star Wars PLUS earn a bonus £5 commission. If you're new on our programme or you've been a bit quieter than usual, we're offering a £5 bonus payment on your first order to get you started. This is ON TOP of any normal commission earned and will be payable within 21 days of the qualifying order being received. The promotion will be running for the rest of the month which gives you plenty of time to start your campaigns. To qualify for the bonus payment, it must be your first order since January 2015. We are proud to announce the launch of our new site at the end of next month. The new site will come with tonnes of new features, more new products and a better customer experience. At New Era, we're so excited about this launch that we'll be giving away a higher CPA rate during the launch phase because we want everyone to share the excitement with us. More information to come. Watch this space for dates of when the CPA increase period will start. NEW ERA x STAR WARS. Re-releasing in Europe. Limited to 144 pieces. Creative available on AWIN from tomorrow, 18th June 2015. Our Summer Sale will start tomorrow, 18th June 2015 where we'll be discounting items upto a massive 70% off original price. We have lots of banners and creatives for you to use and the banners are up for use on the AWin interface under the Events and Promotions tab. Of course, if you're eager for your parcel or have a last minute gift to purchase, you can opt for our next day delivery service for a small additional cost. What's more, is that if your order is above £75 we'll throw in that Next Day Delivery too. Our publishers are currently seeing an average conversion rate of 9% and with all the great offers we're introducing, there's no better time to get involved. If you have any further questions or would like to talk to us, contact our Assistant Web Manager, Annayah Feroz on email at: annayah.feroz@neweracap.com. We're always happy to hear from you and work on bespoke deals that meet your goals. £5 bonus commission on all orders. Last few days to take advantage of this offer that has proved very popular with our customers in the previous week. * minimum spend must be over £10. **please note offer excludes New Era by You products and gift cards. Our Summer Sale will start 18th June 2015 where we'll be discounting items upto a massive 70% off original price. We have lots of banners and creatives for you to use and these will be up on the AWin interface by Monday 15th June 2015 ready for you to start promoting. Of course, if you're eager for your parcel or have a last minute gift to purchase, you can opt for our next day delivery service for a small additional cost. What's more, is that if your order is above £75 we'll throw in that Next Day Delivery free of charge too. We know the long Bank Holiday weekend may have left wallets feeling lighter than normal, so we're giving £5 off online purchases for the next 2 weeks starting Monday 1st June 2015. With new styles coming in next week, customers will be spoilt for choice! Strike a pose in snakeskin with the Reptivize Pack. Four Teams, One Winner - Euroleague 2015 Official Headwear. The Euroleague Semi Finals and Finals will air this weekend, shown on 36 networks and broadcast to over 200 countries on six continents. Join in the hype and support your team. Promotional creative and banners available on AWin. The latest graphic collection by New Era delivers bold all over print headwear and apparel in an array of sun-bleached hues. The collection draws upon seasonal fabrics and eighties style apparel for a truly authentic summer vibe. Featherweight fabrics streamlined with breathable mesh. Make an impact at light-speed with the Hyper Mesh collection. Please note that from January 5th 2015 will will no longer offer the Tiered structure based on publisher feedback. Instead all commission will be set to a default level of 5%. However, we are keen to work closer with affiliates so if you wish to runa unique promotion with us please email sarah.howe@adnams.co.uk. Further Sale Reductions and 15% Off Voucher Code! We're bringing back our most popular offer of 15% off everything. The code will be running with immediate effect until the end of the month, which gives you plenty of time to bring in the sales - especially with the launch of our New Collections. The Sale has been hugely popular with our customers and to give the sale a final push before it ends, we've reduced selected lines even further. To help promote the sale, we've uploaded a range of banners in the Affiliate Window interface. If you want something more bespoke, you can email your account contact, Nyah Feroz on annayah.feroz@neweracap.com with your requirements. Our Kids and Youth range proved so popular we've come back with even more styles to choose from. Fresh In - New Era Clothing. Fresh in, we have lots of new additions to our clothing line this Summer. Not only do we have new designs and styles, but we've also introduced track pants, tanks and shorts to our range. We've applied the same creativity and quality that we do to our caps, to our apparel, so our customers can expect nothing but the best in style and quality. What's more is that we're giving away 10% commission on clothing sales too! 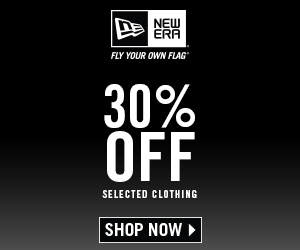 New Era are now offering Free Shipping on ALL orders across Europe. If you order below £25/€45 then your parcel will be delivered FREE through our economy service. If your order is above this, then we'll send your delivery through our faster, tracked service at no charge! Either way, customers can now benefit from free delivery on all orders across Europe. Our top publishers are currently seeing a conversion rate of 23% and with all the great offers we're introducing, there's no better time to get involved. If you have any further questions or would like to talk to us, contact our Assistant Web Manager, Annayah Feroz on email at: annayah.feroz@neweracap.com. We're always happy to hear from you and work on bespoke deals that meet your goals. Just a quick technical update regarding updated commission setup for Hobbycraft. We will be rolling out a new commission structure next month, starting August 4th 2014. The high rate of 10% commission will remain but be for new customers only, and commission for existing customers will be 5%. The current rate, set at 10% across the board, will be tracked and paid throughout July so take advantage of it while you can! Get in touch with any questions, queries, or opportunities. Seasonal Cellar (Wine Club) Subscriptions: Although customers may sign up online the transactio takes place at a later dat offline when the quarterly cases are ready for dispatch. En Primeur & Fine Wines - These products have been withdrawn from the programme because of a recent spate of fraudulent activity. Fraudulent orders have been placed in order to gain the high commission resulting from these high value items. To prevent further issue we have withdrawn these products from the programme. The affected products can be found here ( Fine Wines and En Primeur). Gift Vouchers - Commission will not longer be paid on orders containing only vouchers due to their monetary nature. Gift Cards - Commission will not longer be paid on orders containing only gift cards due to their monetary nature. COMMISSION INCREASE UNTIL END OF JUNE! We had a record month in May thanks to YOU! As a way to thank you and reward you for your hard work, we've decided to UP the commission rates until end of June. The more sales you get in, the more you earn. Take a look below and earn up to 12% commission on the sales you generate! The above commission rates will come into play from Monday 9th June 2014 until the end of the month! With our Summer range just come in, creative to help put the word out there and increased earning potential, there's never been a better time to work with New Era. We'll be going into Summer Sale this Thursday 19th June 2014 with a huge range of New Era caps, baseball caps, 59FIFTY's, Snapbacks and New Era Clothing with nearly 500 different lines. We've uploaded a range of banners in the Affiliate Window interface to help you shout out the great offers we have on. If you want something more bespoke, you can email your account contact, Nyah Feroz on annayah.feroz@neweracap.com with your requirements. In 1993 New Era Cap signed rights to be the official headwear manufacturer of all on-field MLB teams. 20 years on, to celebrate this major event, New Era is releasing the Diamond Collection from 1993 with MLB teams in official team colour from the 1993 season. This is on the 59FIFTY as it was originally in 1993 to keep true authenticity of this historic collection. Perfect for collectors and fashion conscious customers alike. To push sales, we've added lots of banners for your use on the Affiliate Window interface. The 1993 Collection is Back. New Teams. Original Colours. Original Styles. The time has come. Represent your country this Summer. Increased commission until end of June! The Flag Front collection has landed online. Fly your colours with pride. We have a suit of banners in all sizes to help promote this popular Flag Front range in time for the World Cup. These are available on our Affiliate Window page. Further lines added to the New Era Outlet! Plus get a further 33% off! Ready to mix and match? Elevate your hook up game with the Colour Block collection. With great shipping options, there's never been a more attractive time to promote New Era. With only 7 days left until Christmas, get your presents from PC World delivered in time with these last order dates below. Don’t forget to use the following message “Order by the 23rd December for delivery in time for Christmas” when your promoting this across your sites. To receive free delivery in time for Christmas our last order day is 20th December by 2pm. To receive delivery in time for Christmas our last order day is 23rd December by 5pm. To receive delivery in time for Christmas our last order day is 24th December by 8am for delivery 5-8pm on 24th December. • Last reservation date before Christmas: reserve by 3pm on Tuesday 24th December. To collect your item before Christmas please makes your reservation by 3pm on 24th December. Your item will be ready for collection one hour after you make your reservation. Our stores close at 5pm on 24th December. Enjoy our special AW12 rate! Plus we’re offering shoppers great voucher code discounts with savings of up to 15% off! We have some exciting news, we've raised our commission to a massive 15% on our Peach Home Office Kit product. So for every one you sell at £39.99, you'll now get 15% commission - thats an easy £5 commission per sale! 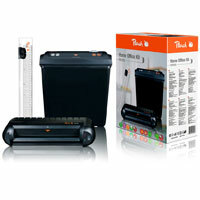 This great Peach product is easy to sell - it includes a Shredder, Laminator, guillotine AND even has first class delivery included! All you need to do is copy the below tracked link into your website or blog and start earning your commission today! Remember to replace !!!id!!! with your Affiliate Window ID. Don't forget, we're also giving away a handy PC Cleaning Kit to EVERY affiliate who refers a sale but only until until 31st March. All you have to do is drive ONE SALE before this date and we'll send you your FREE gift as a "thank you" - simple! Don't miss out - click here to get started today! Cartridge People have been supplying ink and toner cartridges to consumers via the web for 10 years. We always aim to deliver the very best in all we do; your satisfaction with our service is our prime concern, always. We offer you a wide range of fantastic offers and deals on original and compatible toner and ink cartridges for the leading printer brands including Brother, Canon, Dell, Epson, HP, Lexmark and Samsung - plus many more! Why join the Cartridge People affiliate programme? •	Up to 15% commission value. •	Regularly updated creative and links for use on your website or blog. •	Regular communication of special offers. •	Highly competitive cartridge special offer bundles. •	All prices Include delivery and applicable taxes – no hidden extras! •	Save over 80% off OEM cartridges. •	Full 100% 'No quibble' guarantee. •	SSL & VERISIGN certificates ensure secure on-line shopping. •	Choose from original or compatible cartridges. •	Free and easy returns procedure. •	Recommended by our customers. Please feel free to contact us if you need any help or have any questions about our programme – we’re always happy to talk to our affiliates, just email louise@h2ecommerce.com. Click here to join the Cartridge People affiliate programme today! Thank you for your continued support on the JJB affiliate programme, since the programme has launched it has gone from strength to strength. As of the 1st April the standard commission rate for all affiliates will reduce from 8% to 6%. We still feel that this new commission is comparatively strong in the sports wear market.